Home > Other > It’s Sushi Time! 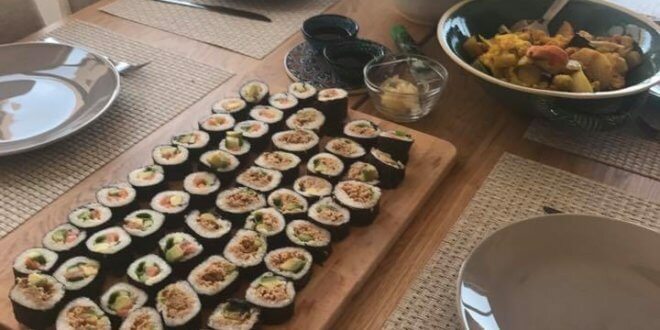 The sushi is great here in the Middle East, but back when I was living in Australia, I used to live on hand rolls (basically a sushi roll that hasn’t been cut) with cooked tuna and mayonnaise – now I know the real sushi fans will tell me that that’s not real sushi, but those hand rolls actually taste like a small slice of heaven. 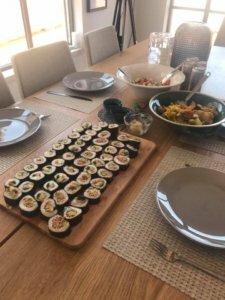 I’ve always been interested in making sushi, but the task always seemed too daunting to even try. The whole process seemed to be so complicated. How on earth will I fit everything in and then roll it without it all falling out? Not to mention, how on earth do you make that delicious, sticky rice?! Last week I told my husband that my craving for my beloved sushi hand roll is just too much to handle, and we NEED to try to make it. He reluctantly agreed, and so to the supermarket we went! We bought everything we needed – seaweed sheets, tuna, mayonnaise, sushi rice, and sushi rice vinegar. We came back home, set out all the ingredients, and got to work! 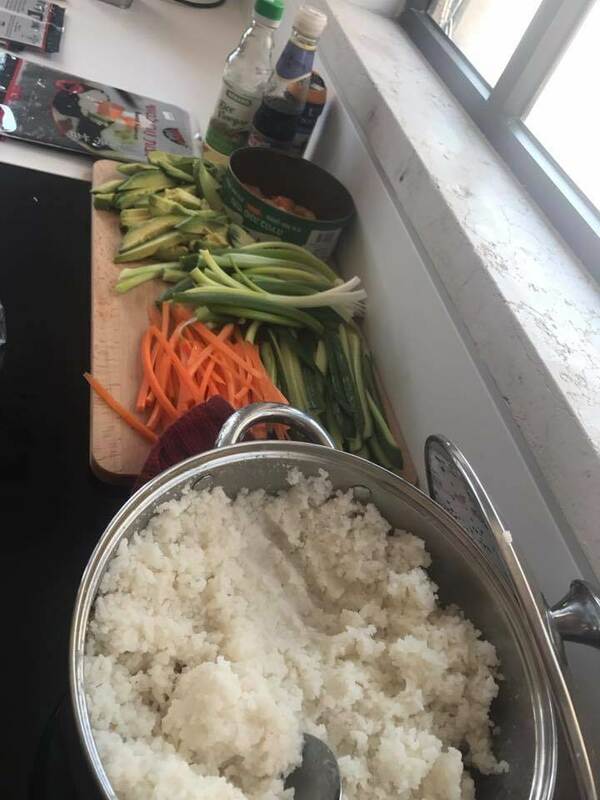 First, to make the rice, we put one cup of rice with one cup of water. Then we added two tablespoons of rice vinegar and one tablespoon of sugar. After around 8 minutes, the sticky rice goodness was ready. We were told to keep the lid on as much as possible during the sushi making process to make sure it stayed fresh. We laid the seaweed sheets down (smooth side up) and started smoothing the rice on them, leaving some room on the top quarter. Then, in the middle of the sheet we put around 2 inches of tuna mayonnaise, and on top of that, pieces of avocado, carrots and cucumber. Now it was time to roll! We watched some YouTube videos to understand the technique, and it was actually really easy with the help of the bamboo mat. The result was DELICIOUS! 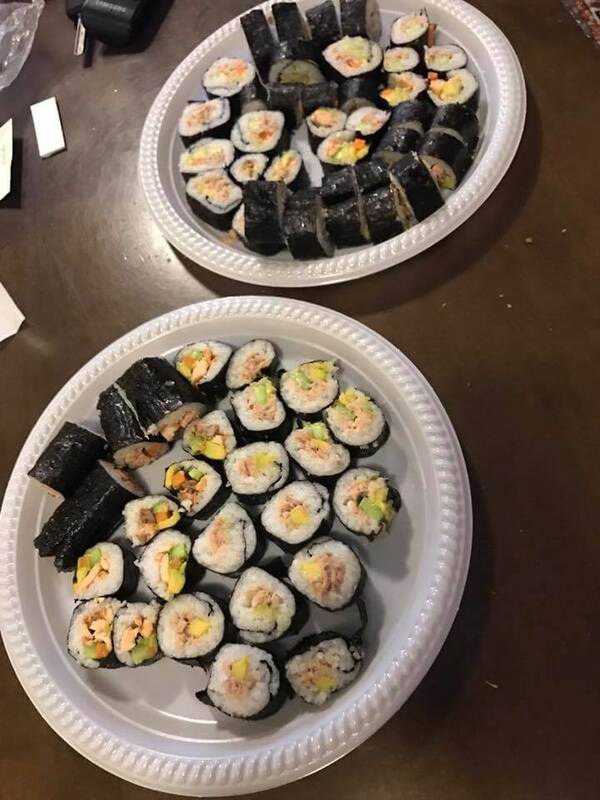 Maybe not the prettiest sushi rolls ever, but that will come with practise! We ended up cutting the hand rolls (sad face) to pieces, but for a second I felt like I was back home in Australia, eating my delicious sushi! I definitely recommend trying! Next Should You Buy Your Wedding Ring Online or From A Local Jeweler?